DENVER, Aug. 28, 2018 /PRNewswire/ -- Technicians have completed construction on the spacecraft capsule structure that will return astronauts to the Moon, and have successfully shipped the capsule to Florida for final assembly into a full spacecraft. The capsule structure, or pressure vessel, for NASA's Orion Exploration Mission-2 (EM-2) spacecraft was welded together over the last seven months by Lockheed Martin (NYSE: LMT) technicians and engineers at the NASA Michoud Assembly Facility near New Orleans. Orion is the world's only exploration-class spaceship, and the EM-2 mission will be its first flight with astronauts on board, taking them farther into the solar system than ever before. 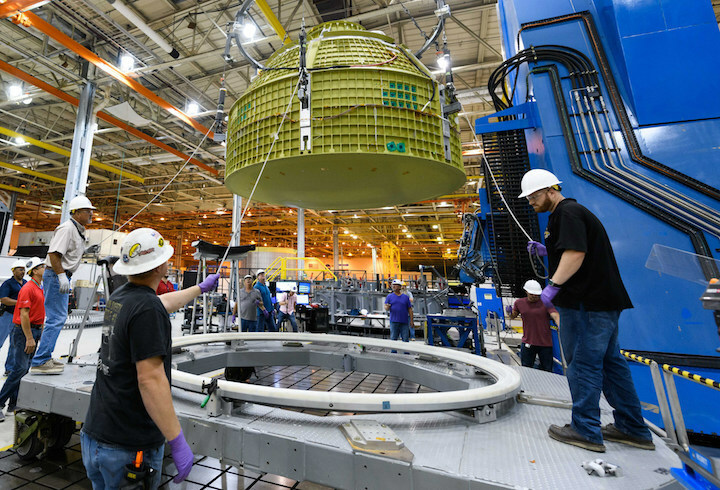 At the NASA Michoud Assembly Facility in Louisiana, Lockheed Martin technicians have completed construction of the first Orion capsule structure that will carry humans to deep space on Exploration Mission-2. Image courtesy of NASA. "It's great to see the EM-2 capsule arrive just as we are completing the final assembly of the EM-1 crew module," said Mike Hawes, Lockheed Martin vice president and program manager for Orion. "We've learned a lot building the previous pressure vessels and spacecraft and the EM-2 spacecraft will be the most capable, cost-effective and efficient one we've built." 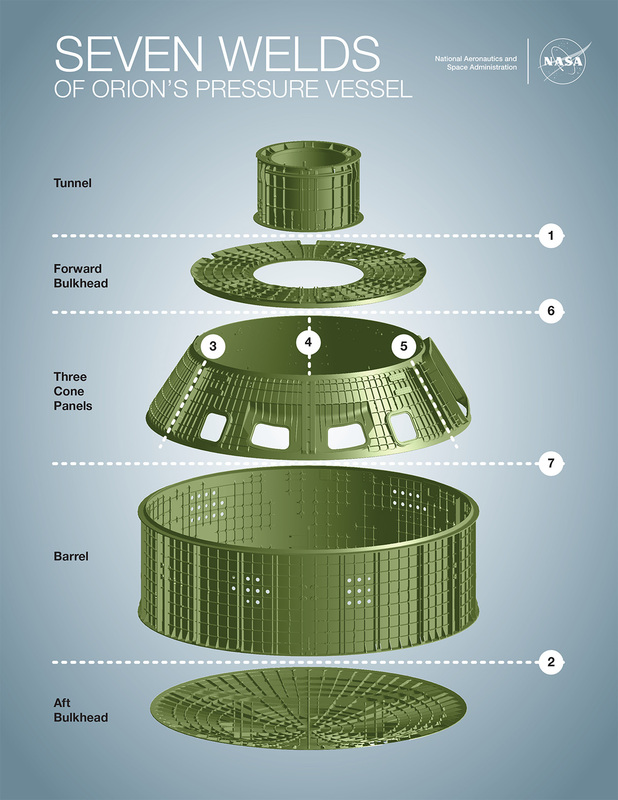 Orion's pressure vessel is made from seven large, machined aluminum alloy pieces that are welded together to produce a strong, light-weight, air-tight capsule. It was designed specifically to withstand the harsh and demanding environment of deep space travel while keeping the crew safe and productive. 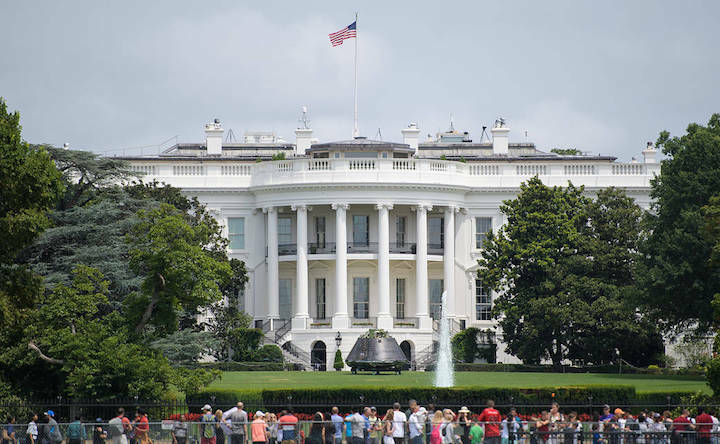 "We're all taking extra care with this build and assembly, knowing that this spaceship is going to take astronauts back to the Moon for the first time in four decades," said Matt Wallo, senior manager of Lockheed Martin Orion Production at Michoud. "It's amazing to think that, one day soon, the crew will watch the sun rise over the lunar horizon through the windows of this pressure vessel. We're all humbled and proud to be doing our part for the future of exploration." 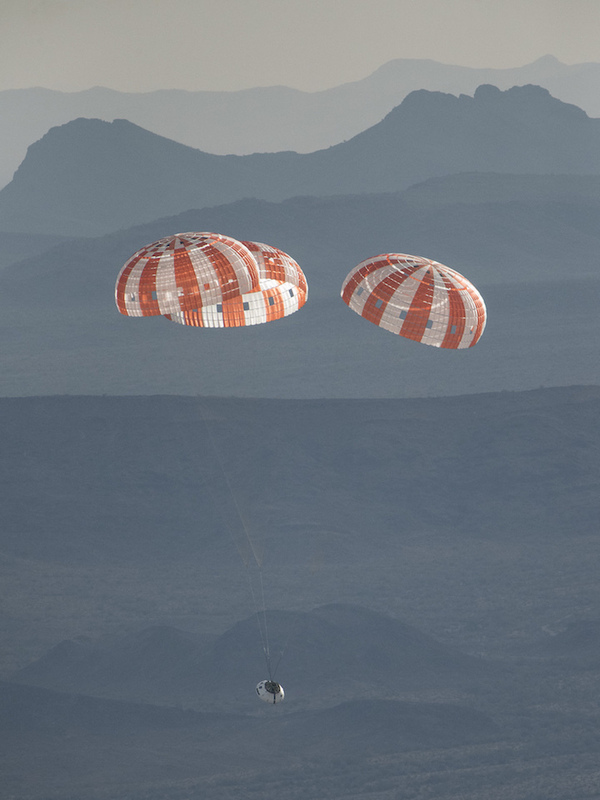 The three main orange and white parachutes help a test version of NASA's Orion spacecraft safely descend to the ground in Arizona. 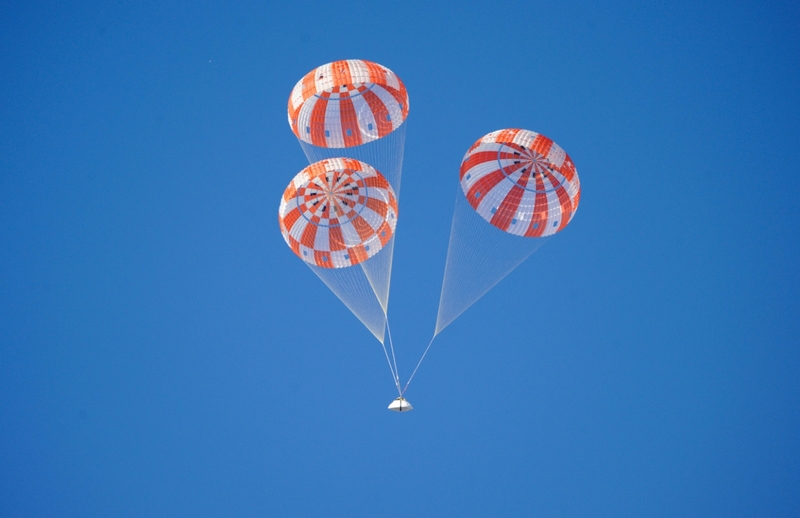 On Sept. 12, NASA engineers will test the Orion parachute system at the U.S. Army Proving Ground in Yuma for the final time to qualify them for missions with astronauts. 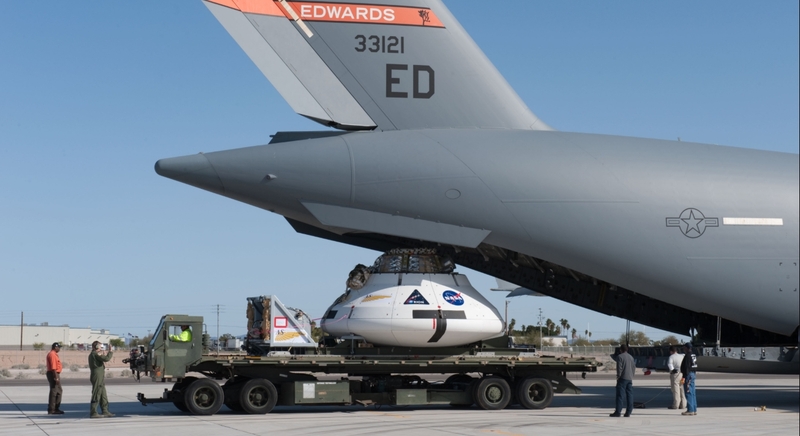 The test series – conducted in Yuma’s proving grounds for the US Army in Arizona – has mainly used a boilerplate Orion spacecraft dropped out of the back of a C-17 plane. These tests have been conducted since the early days of the Constellation Program (CxP). 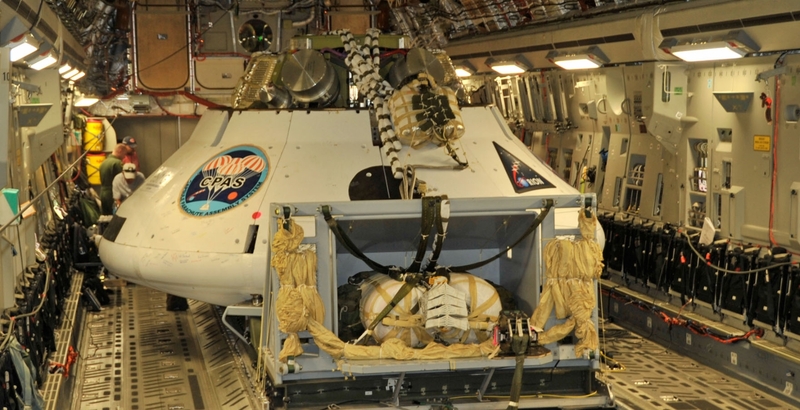 The tests use a Parachute Test Vehicle (PTV) system – better known as CPAS – that consists of numerous additional parachutes, required to drag the test vehicle out of the C-17 aircraft via a sledge or pallet system at altitudes ranging from 25,000 to 35,000 feet, providing the correct orientation, altitude and speed, whilst also allowing for the pallet to land safely on the ground under its own dedicated parachutes. The Orion PTV (Parachute Test Vehicle – first generation) suffered a failure back in 2008 when the programmer chute failed to inflate after deployment, critically removing the requirement for the vehicle’s descent rate to be slowed down and to be correctly orientated for drogue chute deployment. The one remaining parachute valiantly remained attached but was obviously unable to stop the vehicle crashing to Earth at high speed on its own, resulting in the destruction of most of the test hardware. 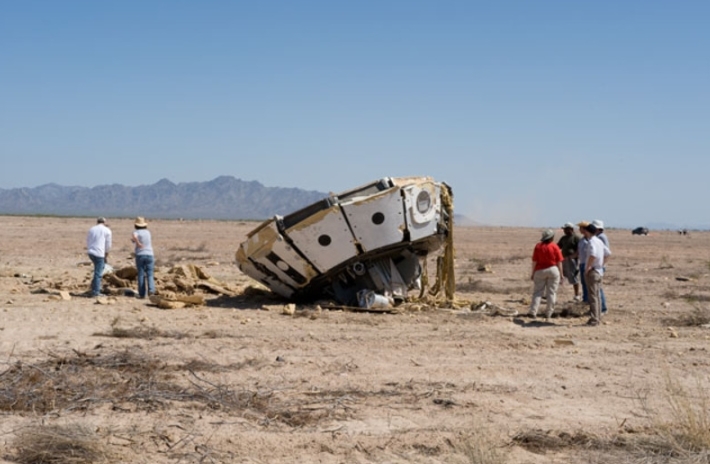 The 2010 parachute test failure occurred during the period Orion was being canceled by President Obama’s FY2011 budget proposal, prior to being fully reinstated, primarily as a Beyond Earth Orbit (BEO) vehicle, by the 2010 Authorization Act. Testing since then has proceeded with numerous successes, as Orion found her new role as an exploration vehicle, with objectives ranging from drop tests that examine how Orion’s wake – the disturbance of the airflow behind the vehicle – impacts the performance of the parachute system, through to examining the effects of one main parachute skipping the first reefing stage. 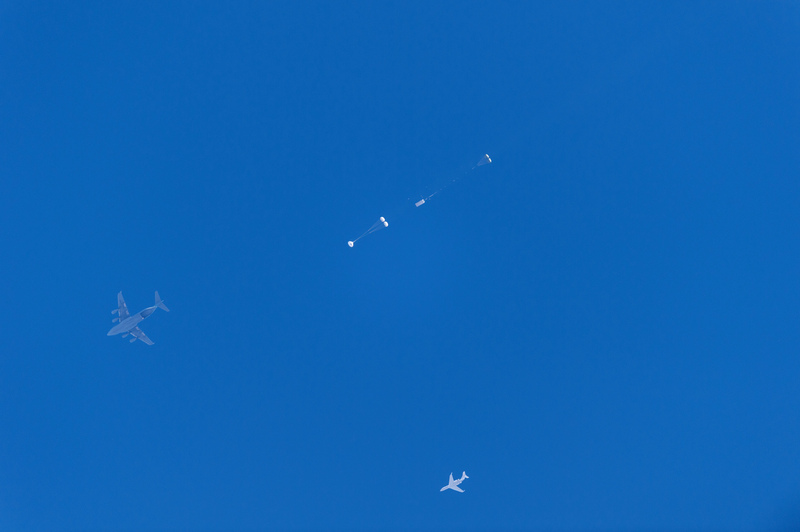 Tests on how Orion would cope during a return with only two of her three main parachutes deployed has been a major part of the test series. 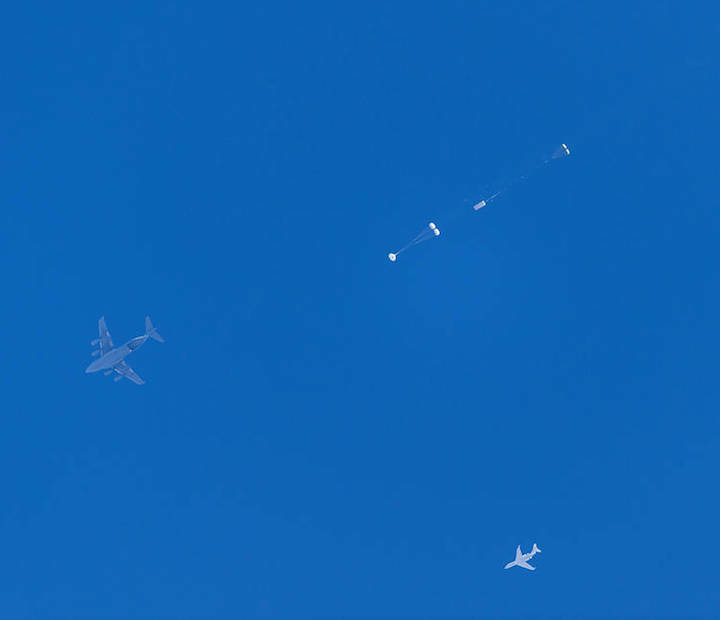 With the C-17 aircraft 35,000 feet above the drop zone, tests have included a scenario in which one of Orion’s two drogue parachutes, used to stabilize her in the air, do not deploy, and one of her three main parachutes, used to slow the capsule during the final stage of descent, also does not deploy. These tests have been classed as the “riskiest tests ever conducted by Orion” – however, they have been deemed a success and provided data to engineers that they will use to qualify Orion’s parachutes for missions with astronauts. Notably, the system is designed to provide the End Of Mission (EOM) success to a crew’s trip into space, requiring a large amount of evaluation to ensure that goal – of bringing the crew to a safe landing in the ocean – is accomplished. Some valuable data was gained via the successful mission of the Exploration Flight Test -1 (EFT-1) Orion in 2014. Another requirement was to deal with the Aerospace Safety Advisory Panel (ASAP) concern called ‘pendulum risk’. 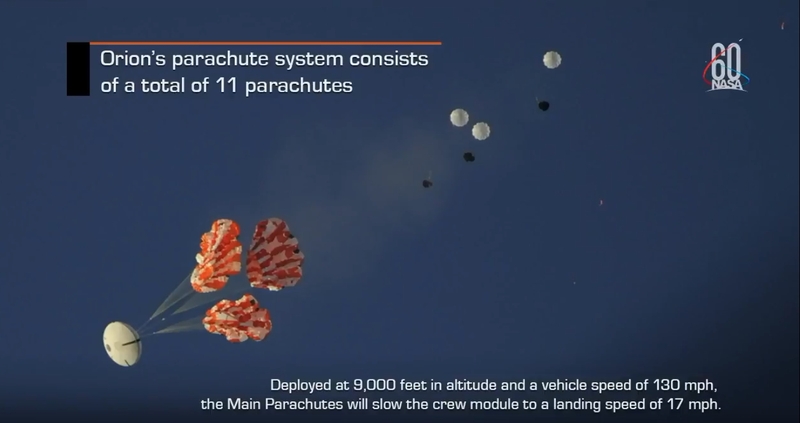 Notably, that issue relates to a scenario where one of the three Orion parachutes fails, but the vehicle is then in an unstable return to the splashdown under the two remaining chutes, risking additional complications, not least for the crew onboard. The ASAP noted pendulum effect is where there is an oscillation of the suspended Orion spacecraft under the parachutes. In total, Orion parachute testing has involved 17 development drop tests and seven qualification drop tests ahead of Wednesday’s final test. The conclusion of the test program will now allow the system to be validated to be used on the first mission for Orion on the Space Launch System (SLS), known as Exploration Mission -1 (EM-1), which will be uncrewed.